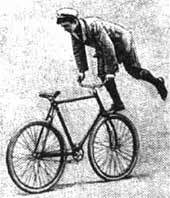 At the end of the 19th century, the bicycle became a popular form of exercise and transport. Acrobatic music hall performers and others began to experiment with what new things could be achieved on this new contraption. 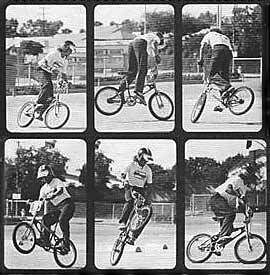 Paul Crow, www.vintagebmx.com, february 2005: As to the birth of freestyle, Im bettin it started about 45 seconds after the birth of the bicycle. Bart de Jong, www.fatbmx.com, december 2006: History class never appealed to me. I dropped it as soon as I could. When it comes to BMX history, it's a different story. You see Ive always thought that BMX originated in the USA in the late sixties until I walked passed a bookstore the other day. On the poster in the shop window was a picture of two kids riding bikes at a fietscross in 1956. The photo was taken in St.-Anthonis, Holland 15 miles from the FATBMX office. I walked in the store, searching for the mag and found Ach Lieve Tijd. The € 4.95 cover prize was a steal for a piece of BMX history. 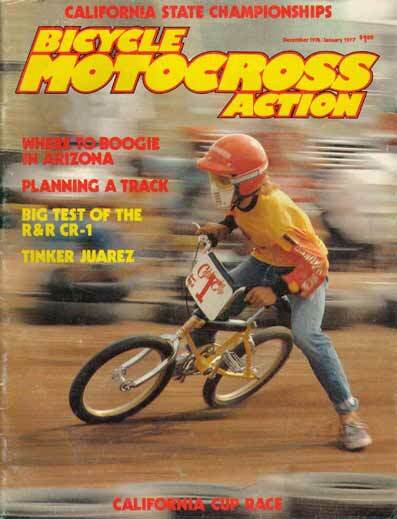 A quick search for more BMX pics was a negative but a story about Motocross I found. It mentioned that the sport of Motocross was started in the Netherlands on modified Nortons, DKWs and BSAs. Seeing that there is a truth to this, it is acceptable to believe that there were kids around pretending they had motorcycles but riding their bikes instead. Bicycle Motocross anyone? 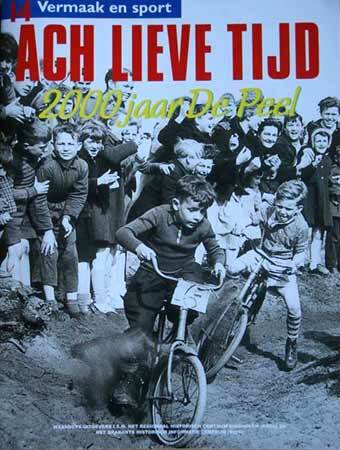 Its hard to beat the date of the organized BMX race on Queensday of 1956. The Bultacos and Montesas had not made it to the USA yet and Scott Breithaupt wasnt even born. Greetings from Holland, the country where BMX was born. 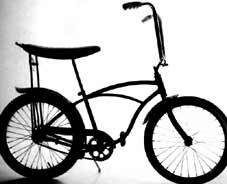 Introduced in 1963, the original Schwinn Sting-Ray changed the world of bikes forever. By 1968 seventy percent of all bicycles sold in the United States were Sting-Rays or copies of Sting-Rays. The steering geometry of the Sting-Ray, combined with the short wheelbase and 20-inch wheels, resulted in surprisingly good handling characteristics. Doing wheelies and riding dirt trails in vacant lots soon became popular. but those opening scenes fired the imaginations of a number of people who would, in a few years, play major roles in the development of BMX. Touched by these opening scenes were future NBA founder Ernie Alexander, BMX Action's magazine Bob Osborn and manufacturer Chuck Robinson. It is credited that those few minutes in the opening scenes is really what opened the doors for BMX. With most guys riding Schwinn Stingrays at first, frame tweakage was abundant. 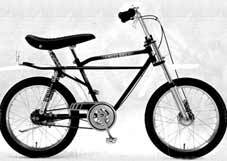 In 1973, the first of the BMX frames started popping up -most of them being monoshocks. Yamaha introduces a fully suspended kids bike called the Moto-Bike. The manufacturers figured that the kids wanted to be like motorcycles, so... "Hey! Let's make gas tanks, fenders, and put shocks on the bikes!" Neat idea, huh? It went that way for a while. Everyone dumped their Stingrays for the mono-shocks. Marvin Church, a local So. Cal. hotshoe, appeared at the tracks on a custom used-to-be Stingray frame that his dad made. It sported welded straight tubes for the front triangle and a higher bottom bracket allowing use for longer 6" inch cranks. This first ever BMX publication hits the bike shops in California. In June 1974 in Orange, Ca. USA, Bicycle Motocross News saw the light. 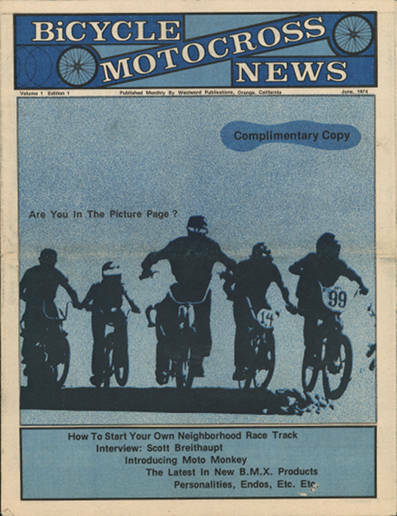 Editor/publisher was Elaine Holt, the originator of the bicycle motocross media. In the first issue, an interview with Scot Breithaupt. Officially listed in this magazine four tracks: Palms Park - Escape Country - B.U.M.S. and Dominquez Park. In Chatsworth, a BMX father named Linn Kastan creates the first pair of tubular BMX forks in the workshop of his company - Redline, a speedway motorcycle frame builder. About the same time, another BMX dad (and part-time drag racer) named Skip Hess is working on the first mag wheels for BMX bikes. Little did he know, at the time, that the MotoMag would sell millions. Following Yamaha's footsteps, Kawasaki introduces an aluminum shocker. Part-time Hollywood stunt-man and part-time motorcycle gas-tank maker Gary Littlejohn and his partner Murphy, adds the first production rigid BMX frame to his line of products that already included sidehacks and mono-shocks. Towards the end of '74, mono-shocks died and rigid frames were born. Skyway sort les Tuff Wheel. Skateboarder, february 1980: Spring, 1975. Escondido "reservoir", San Diego County, Southern California. Pre-park skaters gather here daily to try the smooth walls of this dry cement pond. Local skaters sometimes ride up the dirt trail on Stingrays and BMX prototypes occasionaly taking two-wheel passes. A few more committed bikers usually riding during odd hours cut loose moves and lines that rival anything else going down. Fall, 1975. Carlsbad Skatepark. California's first skatepark is found to be highly functional terrain for a hardy crew of bike advocates. Their carves in the bowl are as high and rad as those of their skating peers, and the moguls seem well suited to their dirt nurtured jumps. Warren Bolster, then editor of Skateboarder, phoographs the creme providing historical reference. Pictures of BMX pool riding were published in Skateboarder Magazine. Thom Lund and John Palfreyman are riding the Key Hole pool in Beverly Hills. Thom Lund, Dig, november 2002: KeyHole was big, deep and round. 13 foot deep with a fair amount of dirt. You had to go up the wall, let the front wheel pop off the coping, pull it to the side and drop the front wheel back in the pool. You had to do this across the bottom and up the other side, going back and forth. Randy Davila. Photo: Warren Bolster. 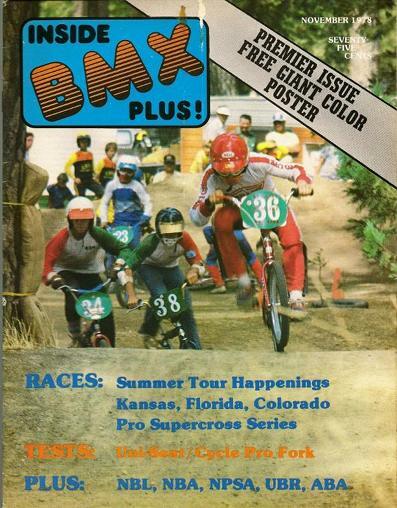 First issue of Bmx Action. 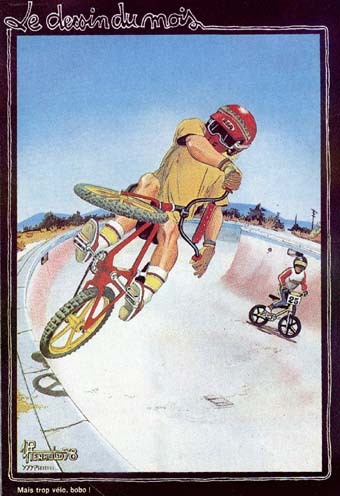 The beginning of "trick riding"
Bob Haro, www.fatbmx.com: I first rode skate-parks in 1976-77. Learning tricks, rollbacks, kick-turns, fakies, etc. Alain Kuligowski, journaliste Français, ramène un BMX en France et le présente à Marcel Seurat, importateur de motos à Beaune qui prend la décision de fabriquer des BMX, copies conforme du modèle américain et qui seront signés de la marque « Bicross ». Skateboarder, february 1980: Fall, 1978. Paramount Lakewood and other Southern California parks begin reserving sessions or whole days exclusively for BMX. Tinker Juarez, a top bicycle motocross circuit racer, makes the cross-over better than most, innovating amazing freestyle moves on the vert. In '78, you were definitely a nobody unless you had a pair of Red Line V bars clamped to your stem. Your stem was probably an Ashtabula (if you were short on cash), or a Mongoose or Cook Bros. (if you were rich). Still, no matter what your cash flow was, Red Line V's were HOT items. The hot bike was a Mongoose. Tinker Juarez, Brian Curnell, Jeff Kosmala, Kenny Knachman, and Dan Oakley were the Factory 'Goose squad. All of those guys ripped. First issue of Bmx Plus! in november. Pour faire connaître ces vélos dun genre nouveau en France, il faut des courses. Quatre clubs vont ainsi voir le jour : Beaune, Altkirch, Delle et Romans. Le premier club est créé à Beaune en février 1978. La Fédération Française de Bicrossing est créée le 1er mars 1978. OTB dessine un aerial dans les pages du magazine Moto Verte. Bob Haro is showing the rock walk in the january issue of BMX Action. Skateboarder, february 1980: Summer, 1979. Rocky Mountain Surf Skatepark Salt Lake City, Utah. Skateboarder staff photographer Jim Goodrich, on special assignment, happens upon a BMX demo here during a major skate competiton. Evidently, park two-wheeling has become more widespread and advanced than we originally thought. Park two-wheeling borrows maneuvers from dirt riding, especially free-form jumping, as well as from skating. Turning the wheel to the side in the air is called a cross-up. BMXers are also pulling off drop-ins, fakies, stalls, slides, 180 aerials, wheelie variations and a wide variety of hybrid moves. Winter, 1979. Southern California promoters and park owners are discussing injecting BMX park events into their 1980 competition schedules Rumors to this effect have already spread through the grapevine and local bike enthusiasts are reportedly gearing up.